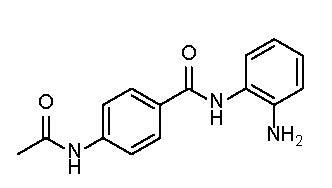 CI-994 is an orally active histone deacetylase (HDAC) inhibitor, IC50 = 0.9, 0.9, 1.2 and >20 µM for HDAC1, HDAC2, HDAC3 and HDAC8 respectively. Mediates G1 cell cycle arrest, inhibits proliferation and induces apoptosis in vitro and in vivo. Increase neuroplasticity during memory extinction. Protects beta cells from cytokine-induced apoptosis.